Oilfield Driving is the ultimate challenge for a trucker. Snow, mud, ice, extreme grades, tire chains and bitter cold temperatures will test your nerves, skill, patience, and even your sanity. 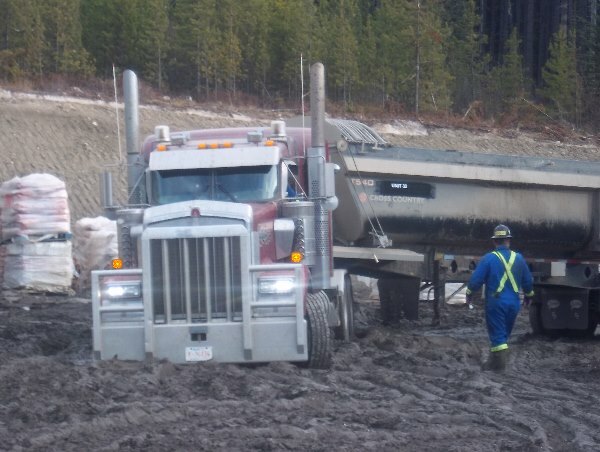 Every trucking job has it’s own challenges, but oilfield driving will be one of the most difficult ones a driver can face. You’ll need to adapt to the roads, hazards, terrain, conditions and weather quickly to be an oilfield driver. This is something you should be used to as an experienced driver, because adapting is what truck driving is all about. As a highway driver you adapt all the time for things like city traffic, mountains or prairie winds. So if you’re a professional driver that craves mental and physical challenges, oil patch jobs in trucking may be the career for you. Oilfield Driving is a challenging career that will test your skill, nerves, patience and your sanity. Welcome to Section 6 in our Oilfield Trucking series. If you’re just joining us on this page from a web search make sure you check out the rest of the series. It’s an educational resource designed to help drivers decide if oilfield trucking is the right career move for them. For those of you not used to driving off road, we’re going to cover some of the challenges you’ll be faced with. There’s enough pictures and stories around to make one think twice about becoming an oilfield trucker. My intention is not to show you how to become a statistic. I’d rather you be aware of how not to become one. You already have all the tools to do any job safely, but how you use them is up to you. After this section we’ll cover how driving in the oilfields is made safer by using a VHF radio. First, let’s cover some of the conditions you’ll encounter so you know what you’ll be getting into. There’s always expectation and reality. We put together this short video clip at night in the dark to show you the reality of what you’ll encounter with oilfield driving. Forget about the nice sunny days and gravel roads, although you’ll have those too. We want you to think about working all hours of the night in snow, ice, mud, or -30 degree temperatures while chaining up for steep icy hills. Are you ready for this part of the job too? Along with freezing rain and glare ice, mud is one of the worst driving conditions you can face. Mud slick roads are comparable to hydroplaning on water or slush. The difference is you lose control over your steering at much lower speeds driving in mud. The mud becomes a slippery film under the pressure applied by your tires. This is a similar phenomenon to a “slide plane” effect that creates a landslide. Your steering tires follow the ruts in the road, and it’s difficult to get out once you’re in them. You’re usually required to chain up and you should always drive slower when conditions are muddy. Sometimes oilfield roads can be shut down during these conditions with the risk of damage to the roads and equipment being increased. One of the toughest things to do is to haul b-trains through mud. It doesn’t matter if you’re empty, loaded, or chained up. The drag from so many tires through thick mud is difficult to overcome.